i've been very busy working on lots of little things, so here are a few more. before i post them, a head's up that my second project here will certainly be included in my seasons round exchange package. so to my partner andrea, if you're hoping to be surprised, read no further! first then, here's a mess of cards i made up. 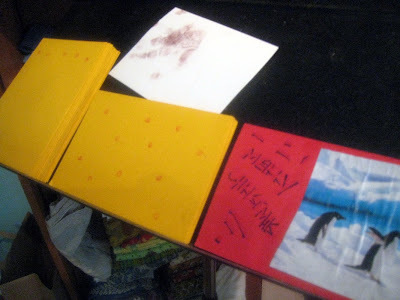 the yellow ones are just stamped with an eraser and pad (i think i got the idea in a martha stewart magazine long ago), and then i tried a little toddler handprint on the white - cute even in its smear. the christmas card is on it's way to a little boy celebrating an early christmas. i heard about it through a friend on facebook. his wish was to receive lots of cards, and that seems easy enough, so send yours along! we're still having camera issues here. it seems that we may have gotten some sand in there because there's a fun grainy-grinding noise when it tries to focus. not that my picture of the next could do it justice anyway. it's a cross between a dreamcatcher and a prism and a snowflake, at least in my mind. 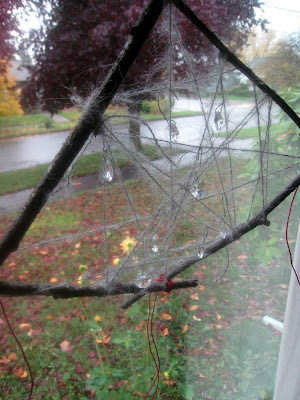 i lashed the sticks together then wove a little yarn design in the middle from which to hang crystals. these capture all those little bits of light through the window and throw rainbows on the wall. when the sun comes out on our front window, we celebrate 'rainbow time'! and watch the colors dance!